"You know this is not the first time we have done this. We have done this before in Afghanistan," said Command Sgt. Maj. Walter A. Tagalicud. "We've known each other and have been really good friends since then." In a scene of deja vu, Command Sgt. Maj. Walter A. Tagalicud passed off America's First Corps colors to Command Sgt. Maj. Michael A. Ferrusi in a change of responsibility ceremony at Joint Base Lewis-McChord Jan. 22. "I want to personally thank Command Sergeant Major Walter Tagalicud," Ferrusi said. "I've known him a very long time and it's true that we did a change-over once before in theater." "Maybe he'll replace me in Korea," Tagalicud said. This is Ferrusi's third duty station as a command sergeant major. He was the outgoing command sergeant major for the 82nd Airborne Division at Fort Bragg, North Carolina. Ferrusi is now part of the I Corps team as the senior enlisted advisor to the commanding general, Lt. Gen. Gary Volesky. He will be continuing one of Tagalicud's missions, lowering the number of non-deployable soldiers within the corps. "Are you ready?" Ferrusi asked. "Are you ready to deploy tonight? Readiness and being ready to deploy right now is not a bumper sticker, it's not a just a motto or something we like to say. Readiness will always be our number one priority." Under the supervision of Tagalicud, I Corps went from an average of 15 percent soldiers classified as non-deployable to seven percent today. "The Corps is well on our way to making five percent, something unheard of in our Army over a year ago," Volesky said. Tagalicud made a lasting impact on I Corps and JBLM. However, JBLM lost not only Sgt. Maj. Tagalicud, but also his wife Carolyn Tagalicud. Carolyn made a noticeable impact on JBLM, mainly through her volunteer work. Her efforts working with Santa's Castle influenced the reach of the program, and many children benefited from her work. "Carolyn's oversight and ability to organize and work with the staff resulted in over 2,000 children receiving toys for Christmas this year, most of whom would not have otherwise," said Volesky. "This is just one of the many significant contributions she has made during her time here at JBLM." Volesky's wife, Leanne Volesky, worked with Carolyn during her volunteer efforts and became a battle buddy to Carolyn just as much as the lieutenant general became a battle buddy to the command sergeant major. "We're both losing our best battle buddies," Volesky said. With a final farewell to his battle buddy, Tagalicud received the Legion of Merit award from Volesky. Volesky believed this award holds significance to the recipient because of Tagalicud's roots at JBLM. "We're going to miss you," Volesky said. "Here's just a piece of ribbon that I hope, when you see it on your uniform, it reminds you of all the folks here and the huge contribution and legacy that you've left." 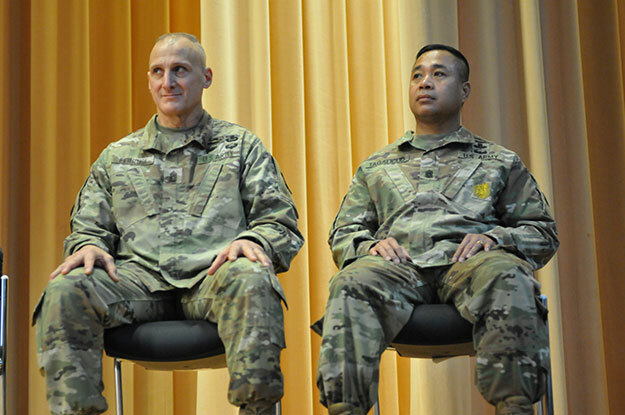 Tagalicud becomes the United States Forces Korea command sergeant major at Camp Humphreys, South Korea, for his next assignment. Tagalicud brings with him the principles of I Corps, the importance of dedicated and motivated soldiers and professionalism. These principles make I Corps, America's Corps, the corps of the future.